This paper summarizes Robert C. Allen, Farm to Factory: A Reinterpretation of the Soviet Industrial Revolution, Princeton, Princeton University Press, 2003. Soviet economic performance is usually dismissed as a failure. In contrast, I argue, the Soviet economy performed well. Japan was certainly the most successful developing economy of the twentieth century, but the USSR ranked just behind it. This success would not have occurred without the 1917 revolution or the planned development of state owned industry. Planning led to high rates of capital accumulation, rapid GDP growth, and rising per capita consumption even in the 1930s. The collectivization of agriculture was not necessary for rapid growth–I argue that industrial development would have been almost as fast had the five year plans been carried out within the frame work of the NEP–but it none- the-less nudged up the growth rate. The rapid growth in per capita income was contingent not just on the rapid expansion of GDP but also on the slow growth of the population. This was primarily due to a rapid fertility transition rather than a rise in mortality from collectivization, political repression, or the Second World War. Falling birth rates were primarily due to the education and employment of women outside the home. These policies, in turn, were the results of enlightenment ideology in its communist variant. En 2003 Robert C. Allen Professor de Historia Economica en la Universidad de Oxford publicó Farm to Factory: A Reinterpretation of the Soviet Industrial Revolution., Princeton, Princeton University Press donde califica la industrialización soviética de muy exitosa, sólo después de la de Japón. Una conclusión semejante no podría dejar de sucitar muchas críticas en estos tiempos en que la ideología capitalista quiere enterrar toda idea de socialismo. Una de ellas es: Wheatcroft, “The first 35 years of soviet living standards: Secular growth and conjunctural crises in a time of famines,” Explorations in Economic History, vol. 46, no. 1, pp. 24–52, 2009. Wheatcrofts utiliza datos nutricionales de la URSS junto con información sobre la evalución de la estatura de los ciudadanos soviéticos para criticar la conclusión de Allen. Paul Cockshott muestra las inconsistencias de los datos nutricionales de Wheatcroft y aplica una técnica matemática a los datos de estatura de los soviéticos para apoyar la conclusión de Allen en “Applying Deconvolution of Russian Adult Heights to Infer Past Nutricional Levels” un artículo de próxima publicación y del cual ponemos a su disposición un borrador que amablemente nos proporcionó el autor. 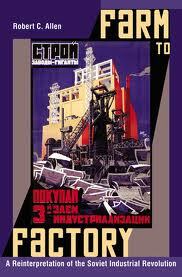 Soviet Industrial Revolution., Princeton, Princeton University Press, 2003. Soviet economic performance is usually dismissed as a failure. In contrast, I argue,the Soviet economy performed well. Japan was certainly the most successful developingeconomy of the twentieth century, but the USSR ranked just behind it. This success wouldnot have occurred without the 1917 revolution or the planned development of state ownedindustry. Planning led to high rates of capital accumulation, rapid GDP growth, and risingper capita consumption even in the 1930s. The collectivization of agriculture was notnecessary for rapid growth–I argue that industrial development would have been almost asfast had the five year plans been carried out within the frame work of the NEP–but it none-the-less nudged up the growth rate. The rapid growth in per capita income was contingent not just on the rapid expansionof GDP but also on the slow growth of the population. This was primarily due to a rapidfertility transition rather than a rise in mortality from collectivization, political repression, orthe Second World War. Falling birth rates were primarily due to the education andemployment of women outside the home. These policies, in turn, were the results ofenlightenment ideology in its communist variant.